There will never be another MJ. So you think MJ is better than Magic Johnson, Larry Bird? Its very hard to compare them. Its like apples and oranges. Magic is the best Point Guard to ever play as far as I am concerned. Each player has their own skill set and advantages when compared to another. 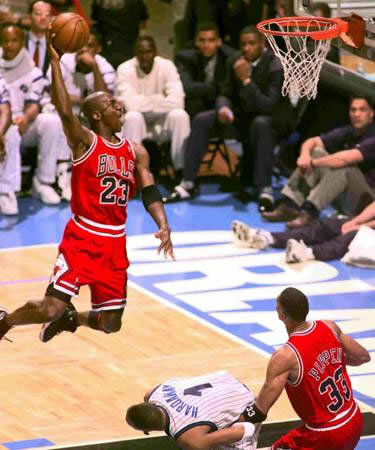 I personally loved watching MJ light it up and I believe he was the most exciting to watch. M.J. is the greatest player to ever play the game and there is no one who can ever say that they were or are greater that Joardan so yall haters just shut up. do anyone knows what game he did that dunk? I know this picture since many years but never had the chance to ask somebody how could realy know it. So if you have an idea I would be happy to hear from you.